The latest play from the Skint Productions theatre company, Karlton Parris’s Once a Year on Blackpool Sands, is a queer tragicomedy that skilfully straddles the divide between the two genres. 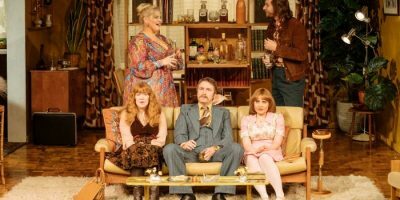 Parris’s script mixes Carry On farce with dramatic realism, a juxtaposition that cuts through the nostalgia and reminds us that the golden age of bawdy innuendo was also the time when gay men were routinely brutalised, rounded up, and charged with gross indecency. It’s the arrival of two of these men that sets up our story, Kyle Brookes and Macaulay Cooper play Tommy and Eddie, two Yorkshire miners who’ve absconded to the seaside to be together. But the coast isn’t far enough to run, and the two men feel the allure of freedom across the sea calling to them. They debate escaping to Hollywood or some other mythic haven where they can be free, but their loyalties to their home still have a hold on them and the conflict threatens to pull them apart. Brookes, in particular, deftly moves between playing the intensity of Eddie’s character, and the comedy of their situation. 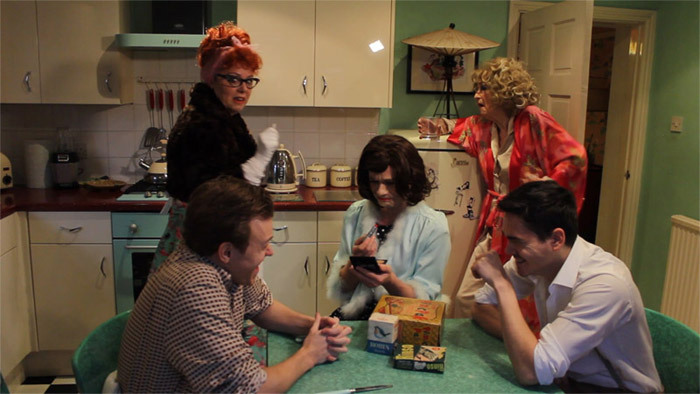 The lovers are consistently interrupted by Gladys, the guest houses’ interfering owner, played by Wendy Laurence James, and her flirtatious daughter Maureen, played by her real-life daughter Mollie Jones, who shines in every comedic moment she gets to plays, be it physical or comedy or delivering laugh-out-loud dialogue. The house’s other residents include a retired communist showgirl, played by Linda Clarke, and a repressed transvestite trying to gather the courage to walk the length of Blackpool beach, played by James Elbridge. These subplots are weaved nicely through the story, but the driving force of the play is the scenes between Tommy and Eddie. At the risk of spoilers, the challenge often faced by queer period pieces is the problem of happy endings, whether to use the story to allow a moment of triumph to characters who are unlikely to have been afforded one in the real world. The play ends on a note of triumph, but it doesn’t pretend that everything’s going to be alright. The production is due to move to New York for a well-deserved Off-Broadway run, and Parris is currently writing the script for a film adaptation. Anyone would do well to seize the opportunity to see it while they can.